I climb, but I’m not really a climber. Fifteen years ago, I tried it out because I enjoyed being in nature. It’s never been my number one sport or passion, unlike most of my friends at 57hours. But I’ll admit it, I don’t mind the “wow effect” from my peers when telling a climbing story, or netting a cool profile picture. To me climbing is social! 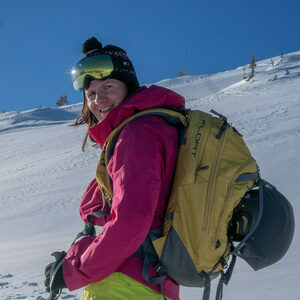 Review by Karmen Marohnic - Climber, skier, writer, and surfer, when needed! Over a “keyboard lunch” I came across a listing for a “women’s” climbing course. Interesting. My recent trip to the Women’s March in Washington was still fresh in my mind. I loved the camaraderie and cool people my daughter and I met. Insta-booked. Now, I know I should wait until the end of post but… SPOILER ALERT: I really, really liked it. Nothing feels better than taking your shoes off after a day of climbing. Ask Alex! A lot of these adventures actually start before you reach your class destination. Communication between you and the guide service can be dodgy. Rob, owner of High Exposure Mountain Guides, responded to my email promptly. His clear instructions where to find trip logistics and complete the waiver helped me feel like I chose the right guides. The actual journey started early on a sunny Saturday morning, I picked up a new friend, Alex, at 7:00 and we ventured north toward New Paltz. This was the first time we’d met in person, but a mutual friend suggested we connect due to our climbing experience. Alex recently spent a year traveling through Asia, and climbed in Thailand and Cambodia. She is very down to earth, interesting, and full of ideas. I sensed an excellent day ahead for these adventure-loving girls. Usually, my routine is to grab a breakfast sandwich on the road. We often hit up Mountain Deli in Gardiner and I have the “Mountain Woman” sandwich: two eggs, bacon, muenster cheese, pesto, and hot sauce on a grilled hard roll. That day though, we had breakfast at home to make it to our meeting spot on time. 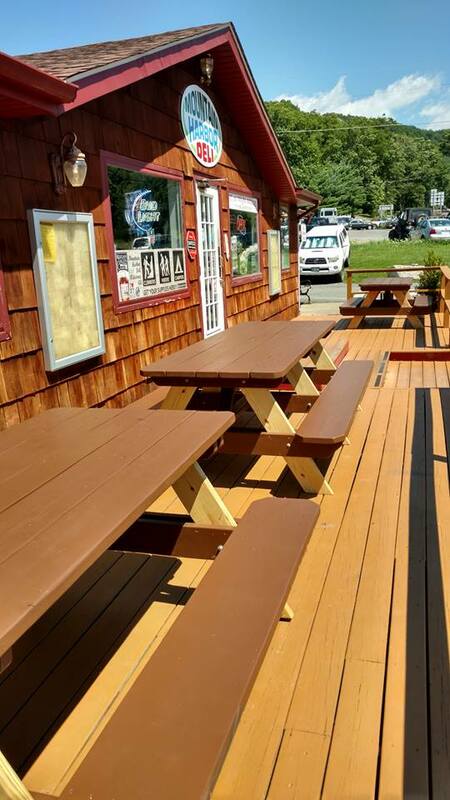 The deli is close to The Gunks entrance and its parking area if we needed something later in the day. What? A man? Kidding… our guide Rob made the trip excellent, start to finish. We met at the white “High Exposure” van at 9 a.m, where our guide Rob was ready for us. Maybe you’re thinking “a man guiding a women’s class?” Yes, because he’s qualified! Would it have been nice to have a girl guide? Hell yeah! But Rob helped take our adventure from good to excellent, no complaints. Other than the essentials like water, all we needed to bring were comfortable athletic clothes. Rob had everything else for us in his van: harnesses, helmets, chalk bags, ropes, and even climbing shoes if we needed them. We came to “Carriage Road”, the easiest access to the ridge’s climbs, and Rob shared some stories. He’d taken over this business from the previous owner in 2007. He rapped about the Shawangunk area and it’s interesting geology and local history. I’d been to the Gunks a dozen times, but I didn’t know the carriage road beneath the climbs is actually a 4.7 mile circle. If you end up in The Gunks don’t feel into climbing all day, you can always, bike, run, walk and explore for amazing views. It’s not “mansplaining” if you pay the instructor, right? We started with an easy route, a 5.5, so Rob could get an idea of our skill levels, strength, and pace. The girls with less experience climbed as well their first time as I’d ever seen in my life. Alex, the most experienced indoor climber in the group, had a bit less experience outdoors. Part of the reason she was excited about the class. Rob had to explain that our climbing shoes cost over $100, but currently we’re using 20% of them. By the end of the day we’d work up to almost full usage. That’s probably the main difference between indoor and outdoor climbing. Indoor uses more upper body strength and there’s always a place for your feet. Outdoor climbing requires you to plan ahead for your feet placement. I adore real rock because you climb it almost like a cat, considering every limb movement and always factoring in balance. Like cats though, not all of us are nimble. Among beginning climbers, women tend to have an edge due to better balance and stretching routines. As the day passed we were enjoying our routes more and more Rob would set-up two parallel ropes with an easier and a harder option, so we all had fun in the same vicinity. The ladies ruled the rock that day! In the middle of the day we climbed near a couple who were attempting a two-pitch route. He was already up the route, and belaying her from the top. Her tone became urgent. She yelled up to her partner that she “can’t do it”, and that he’s “crazy”. She was really freaked out, and few people started to gather to see what would happen. Rob took notice and worked to calm her down and provide a solution. After reassuring her everything is fine, he told her that she can go down, but about a foot to the right she’d find a good crag. After Rob stepped in, she was at the top in a few more moves. She had the biggest smile on her face, proud that she managed that route. Once she was back on the ground, she thanked Rob enthusiastically. That’s when I had my “wow” moment: this exactly why you enlist a guide’s services. I knew how that woman felt. Sometimes when climbing with my husband or other expert climbers, I’m the one crying inside saying “I can’t do it.” Even the most physically strong experience moments of mental weakness on the wall. Just ask world famous free climber, Alex Honnold. Our women’s climbing class group. Rob is one of us now. It’s important to be comfortable when you climb. This is why classes like “Women’s Climbing” are so effective, and even more when you add a friend. The group’s bond is stronger, and there’s strength in numbers. If your first time out is with an ambitious friend, one who buries your hopes by going too big, you’ll be afraid and believe sport isn’t for you. Even if it isn’t, at least you’ll have enjoyed your day on the rocks. The closest transit stop is Poughkeepsie via Metro North. Take the county bus to New Paltz, and/or cab directly to the Gunks. Head north from the city on I-87, which will take you to New Paltz at Exit 18. Take a right on NY HWY 44/55 toward Mohonk Visitors center. A local sandwich shop that keeps you fueled. If you're a woman climber, it's hard to beat the breakfast sandwich made just for us: The Mountain Woman. Helmet, harness, chalk, ropes, shoes. Try A Women’s Climbing Class Today! Based on our trips to local climbing gyms, it’s an awesome time to be a woman who climbs. Adventure sports communities like Flash Foxy connect women with similar interests. No matter your skill or comfort level, there’s usually an outdoor class to match! If you’re looking to get into the sport, read our in-depth reviews of intro classes at local climbing gyms Cliffs LIC and Brooklyn Boulders. Experienced climber? Check out our favorite places to climb around NYC. Climber, skier, writer, and surfer, when needed! Karmen is a core 57hours member and contributor. She's skied and climbed all over the world and she's always looking for something new to get her out in the great outdoors.